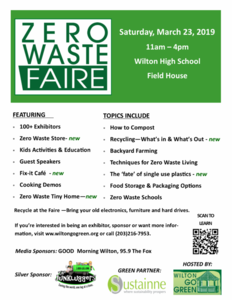 The next meeting of the Zero Waste Schools Coalition will coincide with the 2nd Zero Waste Faire in Wilton on Saturday, March 23, 2019 from 10-11:30am. WHO should join: Any interested stakeholder in starting or continuing to reduce waste in schools and communities (i.e. administrators, teachers, custodians, food service employees, parents, community members, and students). WHY: As part of Wilton Go Green’s Zero Waste Initiatives, the Zero Waste Schools Coalition was formed to create a platform for schools in Connecticut and beyond to connect, learn and share ways to introduce or enhance programming to reduce waste in our schools. questions on how to try and start a program in your school. 11:15 - 11:30 - Wrap Up - Head out to the FAIRE!